(FaithFacts.org) Christians should care about politics because, ultimately, we care about people. Government has an increasingly large influence on the lives of people, thus we cannot ignore politics. Further, almost every law reflects someone’s idea of morality. Since God’s morality is ultimate and universal, society benefits from the Christian’s participation in the public square. That is, society benefits when biblical truth is reflected in law. What we encounter in discussing societal issues today with Christians is that many think socialism is good. In fact, they think that it is distinctly compassionate, thus truly moral. In this essay we will examine why socialism—and its compadres marxism and liberalism—are in fact immoral and inhumane. Conservatism and capitalism, on the other hand, not only objectively produce better results for society, but are the most moral. First, let’s define our terms. 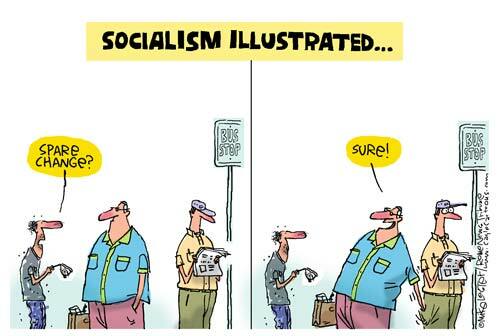 Socialism is government mandated activities or government control of assets. Marxism is using the power of the state to take money from some groups of citizens and give it to other groups (“redistribution of wealth” or “social justice”). Liberalism is a broader term that encompasses both of the above. Progressivism and statism are synonyms for liberalism. Because there is so much overlap, we will use these terms more-or-less interchangeably. 3. When the government redistributes wealth it even hurts the people it is trying to help! This is not necessarily intuitive, but observable. The welfare mess is a classic example of failed government intervention. We have 50 years of experience which proves that oppressive utopian ideas of “compassion” only imprison the welfare class into perpetual poverty. An interesting current comparison is Texas vs. California. Texas has a conservative philosophy of government while California has taken the liberal utopian route. Texas, as of October 2009, had an 8.3% unemployment rate, while California’s unemployment rate was 12.9%—55% higher than Texas. Who is doing a better job for its citizens, including for the working class? Socialism is oppressive to the poor. (A book that is crucial to understanding the problem is Uncle Sam’s Plantation by black author Star Parker.) Watch this fascinating short clip of Milton Friedman on the Phil Donahue show: http://www.youtube.com/watch?v=RWsx1X8PV_A. 4. Every time the government gets involved in something, in the long run it hurts the economy. We must get over the ignorant idea, however well-intentioned, that the economy is a static entity—and like a pie—that if one group of people has a larger piece of the pie, others get a smaller piece. A market economy is not a zero-sum game. The accurate view is, if government policies do not stifle the economy, the whole pie grows producing greater benefits for all. A dynamic economy creates wealth. Economics is about growing the pie, not dividing it. The simple fact of life is that the sectors of the economy that have the larger pieces of the pie are the most productive ones that generate the pieces of the pie for everyone! Remember that the government does not produce anything. So every dollar taken out of the productive economy (or distorts the productive economy) reduces the total output of the economy. Interference in the economy either by direct action or through regulations ends up decreasing the wealth of the country rather than increasing it. Regulations add to the cost of production, lessening efficiency and raising prices—which in turn lowers demand. When this occurs, those at every income level suffer. Further, armed with the power to tax, government fosters stupid economic decisions because it is blinded without a profit motive. A recent example is how the federal government—through both legislation and Federal Reserve policy—encouraged banks to make home loans to people who could not afford them, precipitating the housing collapse. One must be blinded by pre-conceptions to fail to see that any intrusions into the economy with Soviet-like utopian ideologies are ultimately disastrous to its people. The more utopian liberalism is introduced into the system, the poorer it performs. (Important books: How Capitalism Saved America by Thomas DiLorenzo and How Capitalism Will Save Us by Steve Forbes. Also, watch this short video about how the government worsened the Depression: http://dittosrush.blogspot.com/2009/11/thomas-sowell-explains-great-depression.html). 6. Studies show that government is much less efficient at the same tasks as private enterprise or charity. At least one study (http://www.gerrycharlottephelps.com/2009/08/fed-govt-wastes-more-money-than-business-charity.html) showed that Government administrative costs consume 35-55% of the total expenditures. So in the health care debate, for example, if insurance companies make a 3-7% profit on sales, they are still hugely more efficient at delivering health care services than government. And unlike the profit made by private concerns, that 35-55% loss by government benefits nobody—it is essentially lost (wasted). Is there not yet enough outrage at story after story of pork barrel spending in Congress? How numbed does one have to be to fail to see that government by its very nature not only wastes money but is bent to cronyism and fraud? Of course, man’s inherent sinfulness can show up in any organization. But the government has never run an efficient system of any kind anywhere, with the possible exception of the military. 7. Socialism rewards failure. Consider the takeover of General Motors. There have been hundreds of automobile companies that have failed in our history. Every once in awhile, the free enterprise system purges itself of the losers, only to be replaced by more efficient producers that have a better model how to deliver more goods and services that consumers want to buy at a price they can afford. It is suicidal for society to resist this trend. A key tenet of investing is to cut your losses and reinvest in more promising things. In an investment portfolio, nursing your losers leads to a stagnant portfolio of trash. One may think, at first glance, that it is compassionate to save jobs by government interference. But in the long run, the economy is held back by government interference, hurting everyone. Check out this article which explains how even our prized anti-trust laws and the progressive income tax tend to reward the inefficient producers and slow growth: http://mises.org/daily/3856. Socialist communities fail because non-productivity is tolerated. In socialist economies, high goals aren’t set, lousy work is condoned, there’s no motivation to improve one’s living standards, government quashes incentive and innovation, and assets are routinely misapplied. Therefore, there is nothing to encourage the investment of one’s time, effort, or assets. 8. Socialism and marxism ultimately lead to financial destruction. The U. S. budget death spiral in which we now find ourselves places us at a very serious risk of economic collapse. See our blog entry, “U. S. Budget Death Spiral”: http://offgridblogger.wordpress.com/. As Margaret Thatcher said, “Socialism works until you run out of other people’s money.” Let’s just consider the centerpiece of the liberal socialist agenda—Social Security. It is a madoff/ponzi scheme. It taxes workers to pay for those who are retired. There is no actual “Social Security Trust Fund”—even though this term is still commonly used. The liabilities of the Social Security system are unfunded promises to pay retirees. Together with Medicare, these transfer payments are by far the largest item in the federal budget, and are the primary reason why the federal government is on the brink of bankruptcy. The Social Security tax burden hits the low income worker’s budget the hardest. And studies show that if workers were to put what they pay in taxes instead into a conservative personal investment account over their working lifetime, they would have substantially more income at retirement! And they would own the account and thus have something to pass on to their heirs. See http://www.socialsecurity.org/reformandyou/you.html. 9. Liberalism destroys the Rule of Law. America is the heir of the Rule of Law, which originated with the Hebrews in ancient times. America’s Constitution is quite clear that there are specific enumerated powers of the federal government, and all powers not delegated to the federal government are reserved to the states. The liberal agenda in legislation and court rulings has openly ignored the Constitution. Considering federal health care legislation, there is absolutely no authority in the Constitution to force people to buy something they do not want—yet our legislators could care less. When the Rule of Law is destroyed, despotism takes over. The result is predictable: If history is any judge, in time the Constitution will completely crumble into shambles and the United States of America will dissolve. History proves that the yearning for freedom always pushes man to demand the freedom that he is convinced is a God-given right. We remind our readers that both Nazi Germany and Communist Russia had Socialist in their names. Nazism is short for National Socialism. The party led by Adolph Hitler was the National Socialist German Workers Party. Communist Russia was the Union of Soviet Socialist Republics. Objections Considered: The socialist may object to these arguments by saying, “But wait. People have rights.” For example, in the current health care debate, we hear that people have a right to health care. But this is incorrect. Health care is not a right. It is a good/service—like food, clothing, shelter, or life insurance. And the way to distribute these things that is the least expensive to the consumer with the best quality is through private enterprise. The free exchange of goods and services is the most moral and the most effective means of distribution. America’s Declaration of Independence is an historic document that philosophically defines rights. Rights are God-given to personhood rather than something conferred by government. In particular, life is a right. A good or service is not a right. Indeed, America’s Declaration of Independence explains that liberty—that is, freedom from government interference—is also a right. So liberals who say that something like government health care is a right in fact have it backwards. Government interference into health care tramples on liberty and thus tramples on (that is, abrogates) our rights! Liberals place a large emphasis on the spread between the most successful and least successful in a capitalist country. But That spread is even larger in socialist countries. Huge wealth is obtained in socialist countries by cronyism, using political power to garner an advantage. In true capitalism, political power advantage to a few is eliminated. Under capitalism, wealth is obtained by those creating the greatest service or most desirable products that others freely purchase. Which system is the most moral? Summary: Conservatism is constructive. Liberalism is destructive. And nowhere in the Scriptures do we read anything that even remotely resembles socialism. We are not arguing that government has no role to play in society. We are arguing that there are usually constitutional solutions in the free market that are much more effective while being morally upright, consistent with human rights—and biblical.